My sermon from All Saints’ Sunday (November 5, 2017) on Matthew 5:1-12. Listen to the recording at the bottom of the page or read my manuscript below. If we’ve spent time in church, these words from the gospel according Matthew are ones we probably already know. We might not have all twelve verses memorized but if someone starts saying “Blessed are…” – we can fill in some of the rest. Jesus, at the start of his long sermon marking the start of his public ministry according to Matthew, says that there are specific groups of people who have specific kinds of experiences and that these people, in the eyes of God, are blessed. But, right now, as I stand here overlooking the sandbox that we will shortly fill with lit candles, I am drawn to Jesus’ words on mourning. Today is a day where we, as a community, mourn. We will read out loud the names of people connected to this church who have recently passed away. We will light candles for family, friends, coworkers, and colleagues who burned bright in our lives. We’ll remember everyone who mattered to us; everyone who loved us; everyone who, through their thoughts, words, and deeds, filled each of us with so much life. Today we create a space in this church where it’s okay for all of us to just mourn and express that mourning in any way we want to. If you want to be stoic, calm, and collected? That’s totally cool. And if you want to shed a tear, we’ll pass you a box of tissues. All Saints’ Sunday is a day when you get to be just you. But I wonder: does what we’re feeling now match up with what we think being blessed actually feels like? In other words, when Jesus says that those who mourn are blessed, do we really believe him? Now, on some level, the answer to that questions is yes. I mean, these words are coming from Jesus. Jesus, the Son of God, the firstborn from the dead, the one – as the Nicene creed says – through whom all things were made. If we’re going to believe anyone, then we should believe Jesus. His words about those who mourn being blessed is an idea that we can, in theory, get behind. We can hear his words and, as they bounce around in our head, we can reason through the concept of mourning. Being able to mourn means that we had something worth mourning. We had a connection with someone where real-honest-to-goodness-life flourished. The time spent with that person might only have lasted a moment or it could have grown over decades. But we were changed because they were a part of us. These kinds of people are literal gifts from God. So it’s easy, on one level, to say yes, this is what being blessed looks like. We were blessed by special people in our lives and mourning is part of what that kind of relationship actually looks like. But I’ve never been good at keeping life-giving relationships stuck in my head. Emotions, feelings, and my soul get involved. Even when I try to think and reason my way through mourning, there’s still a part of me that…just plain hurts. Or feels empty. Or feels incomplete. It’s as if there’s some kind of hole inside me that is held open by the memory of the person that once filled that space. Even though I trust Jesus’ word. And I know about heaven, the communion of saints, and how, since we are part of the body of Christ, we are always connected to each other – no matter what. Even though I know all of this – that empty space is still just there. This feeling…this reality…is hard to describe and I don’t know if what I feel is something you feel too. But it’s hard to imagine that carrying around these kind of holes inside of us each and every day is what being blessed is supposed to be like. There’s a struggle in Jesus’ words here and it made writing this sermon a bit of a struggle too. In the midst of this struggle, I did what I always do when the words for Sunday don’t seem to be coming. I opened Facebook. I scrolled through my newsfeed, congratulating a friend on the birth of her new baby girl and wondered why my father-in-law was posting pictures of horses. I saved a few articles to read later and I did my best to avoid getting sucked into posts with 200 comments in the various groups that I’m a part of. Some people might call this procrastinating. To me, I was just scrolling. And then, one post jumped out at it. Someone left a photo on the facebook page of a friend and I noticed the caption for this picture first. It said, “I bought you an angel.” And below the caption was a dark and grainy photo, taken at night. There was a candle lit up and sitting on a white base with some figurine or sculpture on its side. I couldn’t make out what the sculpture was but I the candle shined just bright enough to illuminate the tombstone it was sitting on. That angel was for a friend of mine who had committed suicide several years ago. I stared at that picture for a bit and I kept coming back to it as I wrote the rest of these words. When it comes to being blessed, we don’t imagine heartbreak or sadness or having an empty spot inside of us as being what blessed looks like. Being blessed is reserved for for an answered prayer, or when we get or dream job, or when something takes away the worry, anxiety, and stress that hangs over our lives. Being blessed is when the voids and empty parts inside of us fill up. It isn’t supposed to be when we admit the ways we still sad, broken, and still grieving. Yet Jesus says that even us, even those with holes in their hearts and empty parts in their souls – even you are still important to God. Mourning isn’t a process designed to fill up the spaces in our lives that our loved ones still occupy. Mourning is how we learn to live with, and through, death. This doesn’t mean, however, that God caused this mourning or that God really wants the void that we carry to be part of our life. Instead, mourning is an experience that God promises to carry you through because even Jesus suffered heartbreak. Even Jesus mourned. The Son of God stood at the tomb of his friend Lazarus and Jesus just cried. And when Jesus rose from the grave, the holes on his hands from the nails that hung him to the cross were still there. The holes didn’t go away. The holes inside us, these parts holding the memory of those who gave us so much life, are not parts of ourselves that we are supposed to avoid, push aside, or just get over. We mourn because there are people who will always matter to us; there are people who we will always light a candle for; and there are people who showed us what living the faith actually looks like. We mourn because God gives us to each other as a gift – a gift meant to give us life. And that kind of gift is a love that no hole or void or empty feeling can ever overcome. The sadness we feel isn’t the end of the story. The space inside us that feels empty is a space God reserves for our loved ones to fill again. We who mourn are blessed not because of the holes that we carry but because God promises that these empty spaces won’t be the limit to the story God is already telling. 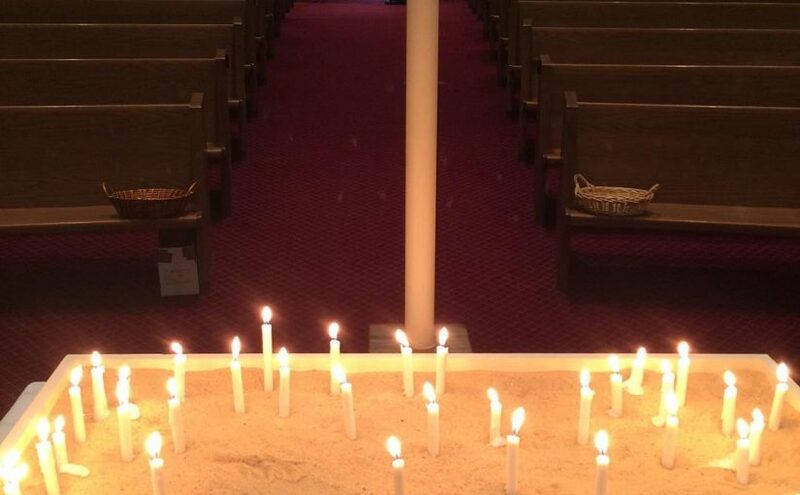 Even though the candles we place today in this sandbox will eventually burn out, the light God gives to each of us is a light that will always burn bright. Blessed are those who today, mourn. Blessed are those who today, ache. Blessed are those today, who feel sad. And Blessed are those who knew us, who loved us, and who are with the Lord forever.